Almost 30 years after having left humiliated and defeated by the Afghan Mujahedeen (freedom fighters), Russia is steadily returning to the neighbourhood: not with troops but with arms to sell and networks to build. The main conduit of Russia’s return has been Pakistan. Moscow’s return to a region – one that it knows well from the days of the 19th Century Great Game – has been driven by two objectives. First, to reassert its presence to protect its interests in the former Soviet states of Central Asia, Russia’s soft underbelly. Second, to counter China’s growing presence as part of China’s ‘One Belt, One Road’ network in Russia’s traditional strategic backyard. Russia’s return has been facilitated by two important factors. One has been the departure of the bulk of over 100,000 NATO-led forces from Afghanistan in December 2014, creating a massive military vacuum in a country that is still unable to stand alone militarily. Although most of the 16,000 military personnel remaining are only there for training, advising and mentoring purposes, the troop-contributing Western countries are fast losing the political will to stay in Afghanistan. 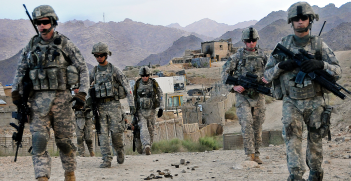 Even the US, with its 15,000 troops stationed in Afghanistan—the bulk of which are involved in special anti-terrorist operations—wants to leave as soon as possible. President Trump made this clear in his August 2017 remarks. Pakistan has also been seeking to diversity its portfolio of strategic partners as a result of increasingly estranged Pakistan-US relations, especially following the elimination of Osama Bin Laden in Pakistan in May 2011 by US Navy SEALs. While Islamabad has a deep and long-standing military relationship with Beijing, Pakistan’s generals would also recognise that putting all the country’s military eggs in the Chinese basket would not be a good idea. It would simply be replacing one dependency for another. Accordingly, partially pivoting to Russia has been a logical policy move on the part of Islamabad. 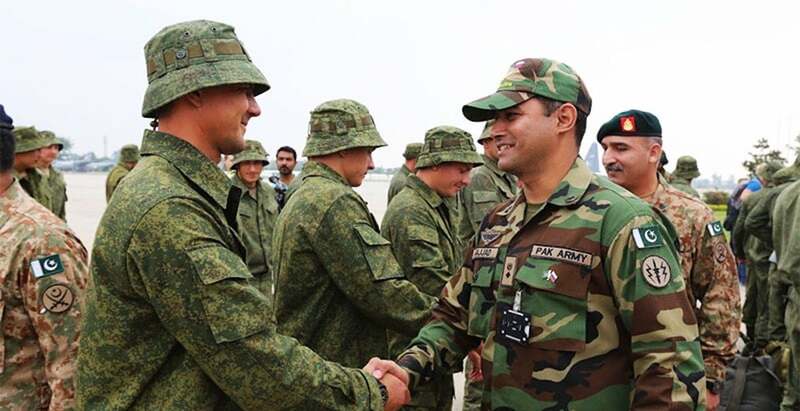 A number of recent developments confirm that Pakistan is definitely warming up to Russia. In April 2018, Pakistan’s Chief of Army Staff (COAS) General Qamar Javed Bajwa visited Moscow and met with Colonel General Salyukov, Commander-in-Chief of the Russian Federation Ground Forces. The Russian host publicly stressed Pakistan’s achievements in the fight against terrorism and its contribution to regional peace and stability. This would have been music to the ears of General Bajwa, the man who effectively calls the shots on all defence and foreign policy issues in Pakistan. It also contrasts strikingly with President Trump’s accusations that Pakistan has been providing safe havens for terrorists and the suspension of USD$ 2 billion (AUD$ 2.6 billion) in American security aid. Pakistan has also been turning to Russia to diversify its military hardware. The latest acquisition of defence materiel has been the delivery of four Mi-35M heavy attack helicopters, part of a $153 million helicopter deal the then-COAS General Raheel Sahrif concluded in Moscow in June 2016. The Pakistan military is reportedly interested in buying another 20 helicopters. But probably the most important issue bringing the two countries closer together is their respective support for the Taliban in Afghanistan. During a Congressional hearing early last year, General Nicholson, commander of US Forces Afghanistan, stated that the Russians were providing military support to the Taliban. Russia vehemently rejected those accusations. However, the Russians have admitted to engaging with the Taliban, arguing that maintaining a strong relationship with the Taliban is critical for political stability in Afghanistan. The Russians also argue that the Taliban is the only bulwark against the greater threat, the Islamic State in Khorasan (ISIS-K), a branch of Islamic State active in Afghanistan and Pakistan. This is a moot point. Regardless of the merits of the Russians’ claims about the threat posed by ISIS-K, Moscow’s support of the Taliban dovetails nicely with Islamabad’s backing of the group, something it has done to various degrees since they were ousted from power in 2001. Very interestingly, in a complete volte-face from his criticism of Moscow’s role in Afghanistan last year, General Nicholson recently stated that he would welcome Russian assistance in stabilising Afghanistan against insurgents fighting the Kabul government. He stressed that Russia and the US shared an interest in countering the terrorists who threatened their respective countries. Such encouraging American statements will certainly facilitate Russia’s return. But will greater Russian involvement in Afghanistan, including continued assistance to the Taliban, increase peace prospects for the war-torn country? Most likely not, especially if Iran, which has also been providing assistance to the Taliban, decides to crank up its aid to the group in the wake of President Trump’s decision to leave the Joint Comprehensive Plan of Action (JCPOA). Needless to say, better arms for the Taliban would most likely diminish its interest—if any—in sitting down to talk with the Afghan government. Washington’s decision to re-impose sanctions on Iran may have unwittingly provided an opportunity for Russian companies to fill the commercial vacuum that this will create in Iran, particularly in the oil and gas industry. There may also be possibilities in assisting with the development of the Iranian port at Chabahar in the Gulf of Oman and the connecting railroad to the Afghan border, especially if India’s promised $2.5 billion investment in these projects gets caught up in the American sanctions net. Finally, Russia could potentially invest in the US$60 billion China-Pakistan Economic Corridor project. Pakistan would very much welcome this, as it would further deepen the connectivity of Pakistan with the region and Central Asia. Whether some of these highly lucrative business opportunities do come to fruition, for better or for worse, Russia has definitely returned to the neighbourhood. Dr Claude Rakisits, who completed his PhD on Pakistan, is Honorary Associate Professor in Strategic Studies at Deakin University. He has been following developments in South Asia for over 30 years. His articles and interviews can be accessed at www.geopolitical-assessments.com. He tweets from @ClaudeRakisits. 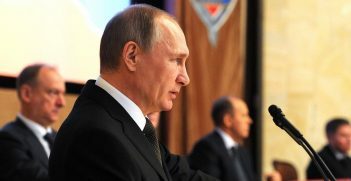 Vladimir Putin's resounding victory in the Russian presidential elections on 18 March has been overshadowed by the recent diplomatic fracas with the UK. However, the scandal is unlikely to affect Putin's new foreign policy objectives.